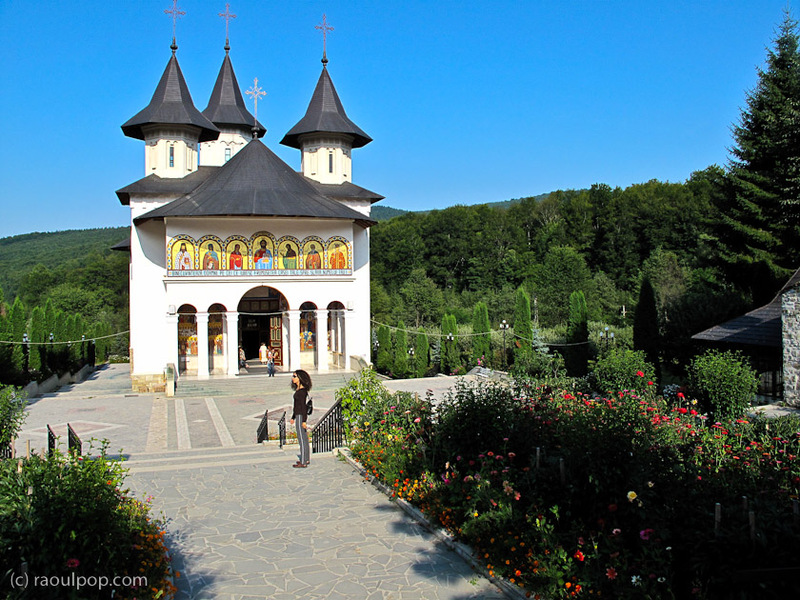 As announced, we returned last week from a road trip that took me through northern Maramures, Bucovina, Moldova and northern Transilvania. (These are all provinces in Romania, by the way.) 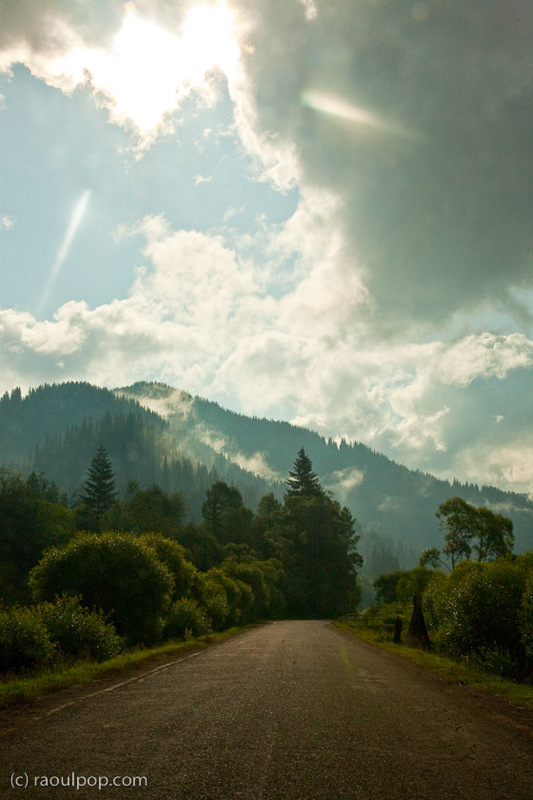 Ligia, my parents and I packed into our car and spent about 1 ½ weeks on the road, visiting various places, mostly in Bucovina. 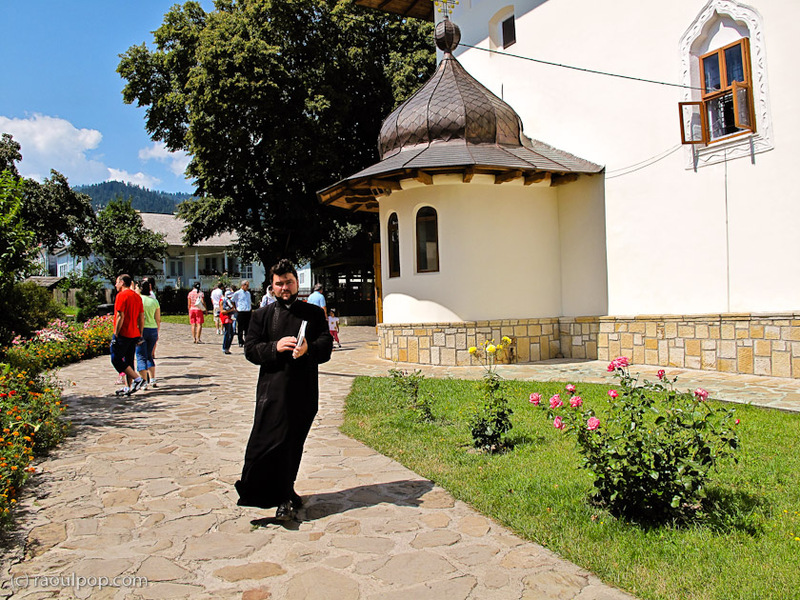 We visited several monasteries (the region has some of the most important in Romania and Eastern Europe), most of which we’d visited back in 1991, so it was interesting to see how they, the places around them, and the people living there changed over the years. 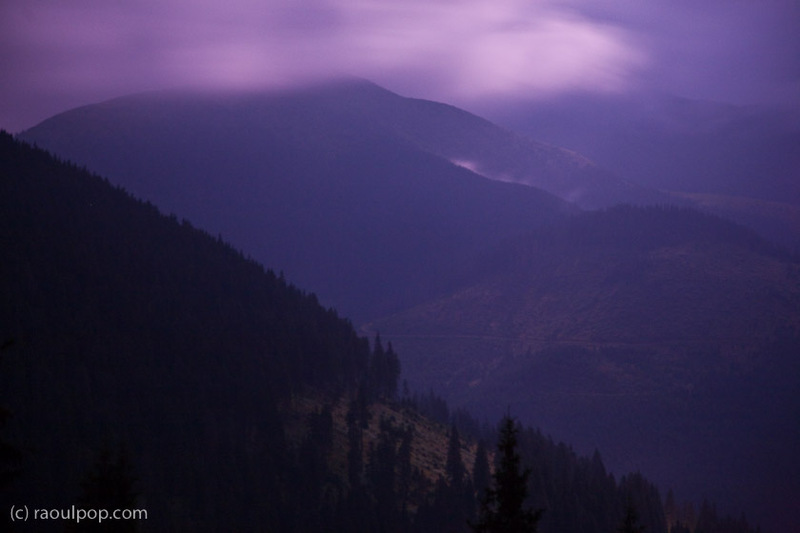 Along the way, as we meandered through the Carpathian Mountain chain, we got to see amazing vistas like these ones. 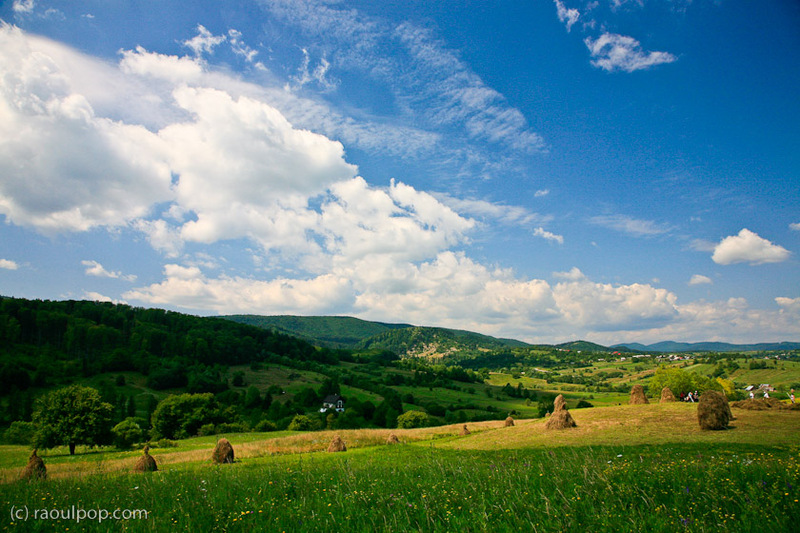 In Maramures. Do you notice the start of a rainbow in the lower right corner? We started with a quick stop in Baia-Mare, in Maramures, where we walked in the newer, more (relatively) modern town center. The historic town center is a few kilometers away from where this photo was taken. 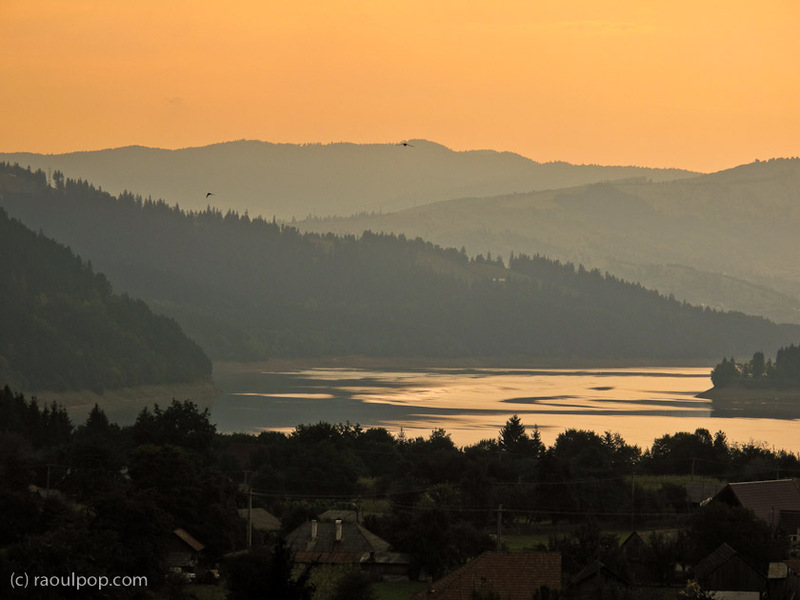 From Baia-Mare, we headed North, toward Sighetul Marmatiei, then West, into Bucovina, crossing over the Northern part of the Carpathian Mountains. 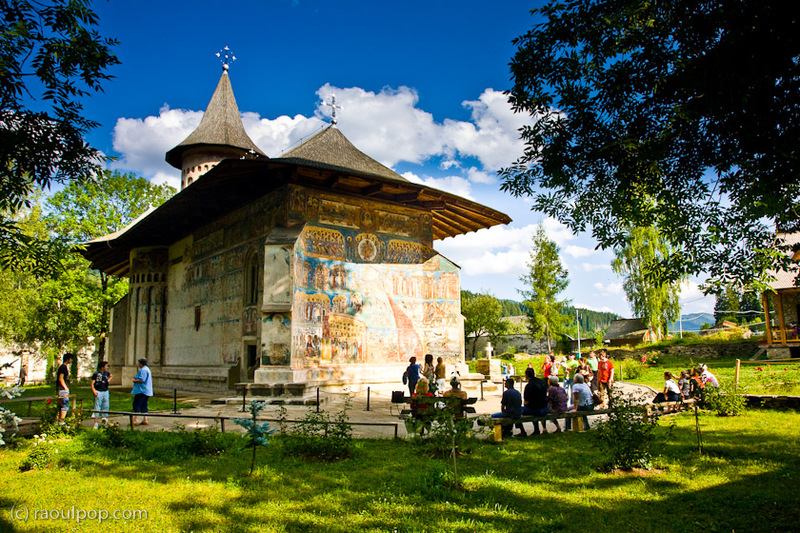 While still in Maramures, we visited the tallest wooden church in the world, Biserica de Lemn “Sfintii Arhangheli Mihail si Gavriil”, in a village called Surdesti. Biserica de Lemn "Sfintii Arhangheli Mihail si Gavriil"
Night came upon us as we drove over Mt. Prislop, the main crossing point from Maramures into Bucovina. 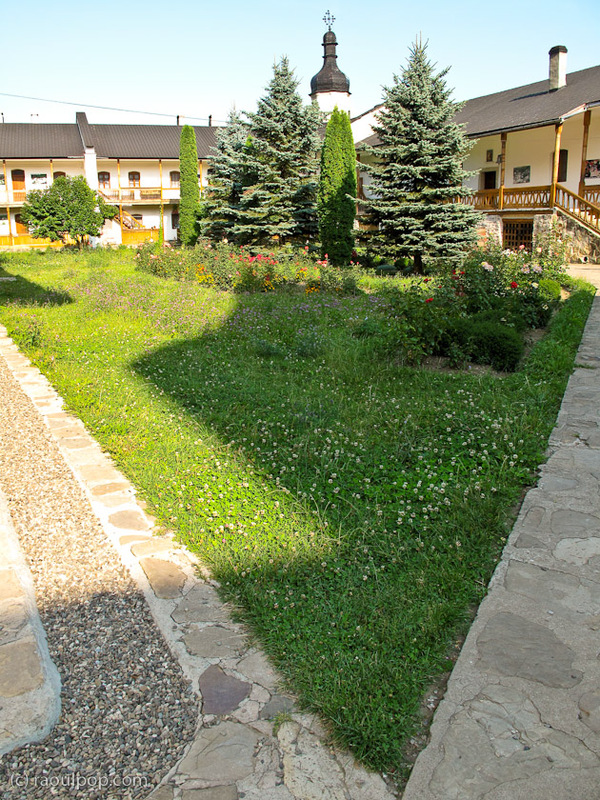 There was no lodging available in Borsa, a mountain resort (what economic crisis?! ), so we drove on and found a cabin at the very top of the mountain. We stopped there, hoping for a memorable overnight stay. Unfortunately, the accommodations left a lot to be desired — the bathrooms in particular — so I spent most of the night mulling over my thoughts and taking photos, unable to sleep. This is one of the ones I made that night. 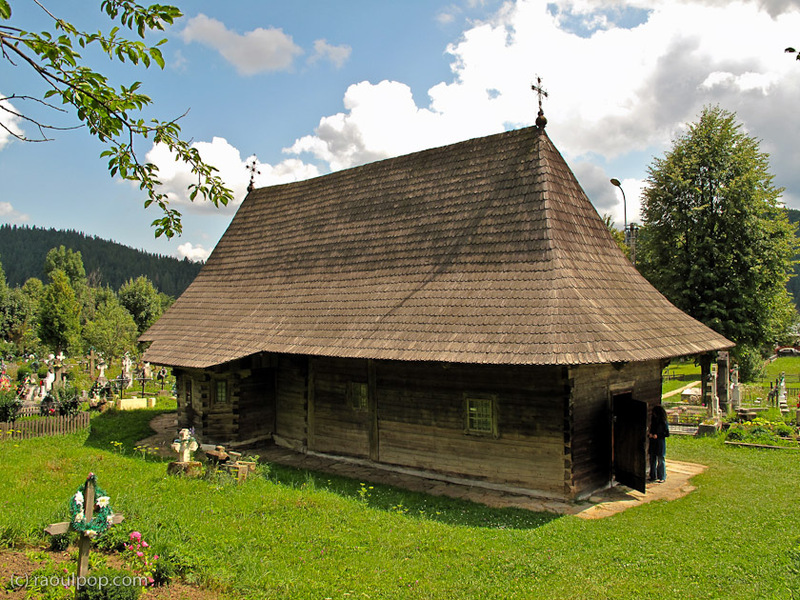 The next morning, we moved on and wound our way into the heart of Bucovina. 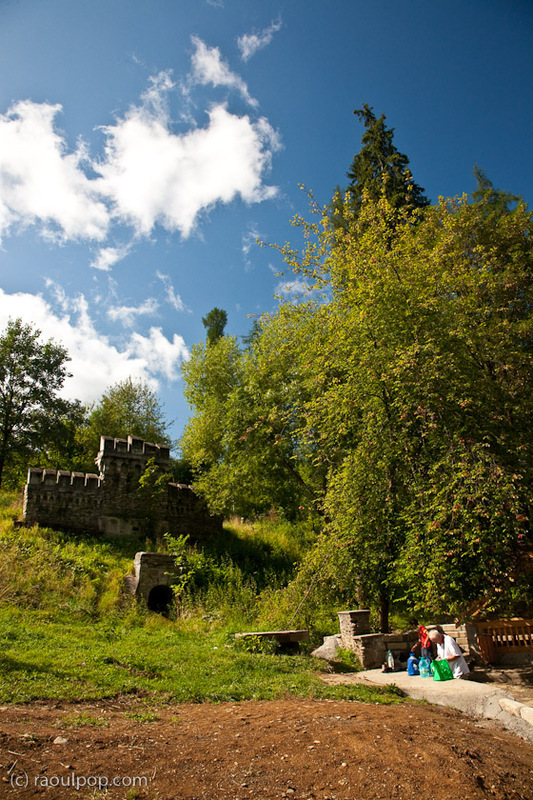 The first stop was the resort town of Vatra Dornei, which is famous for its natural springs. Here’s one of them below. 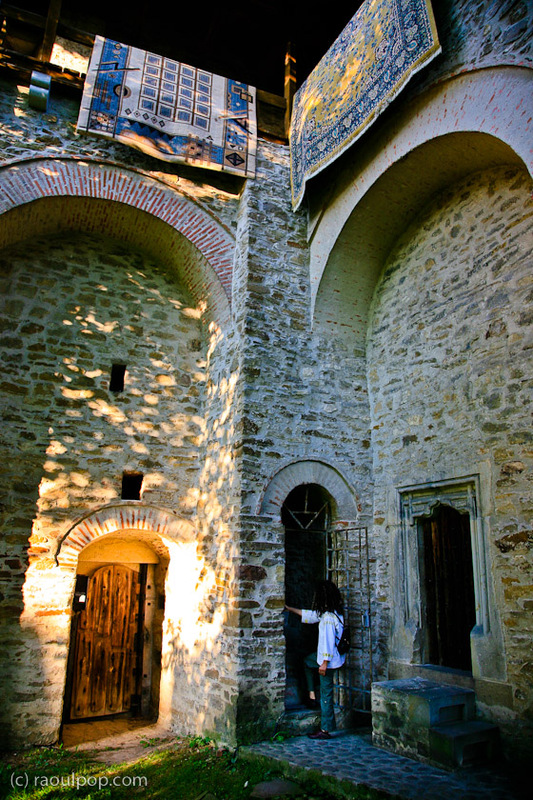 The monastery at Moldovita was next on our itinerary. The second monastery we saw was Sucevita. After not sleeping very well the previous night, and given the lodging crisis, we decided to start looking for a room around 5 pm. To our disbelief, all lodging in the area of the monastery (about 2 hotels and 3 pensions) was taken. I have no idea what economic crisis they keep talking about on TV and in the newspapers, because when I go out in the world, I don’t see any difference. Lodging was either full or close to full at most every place we visited, even in remote locations. 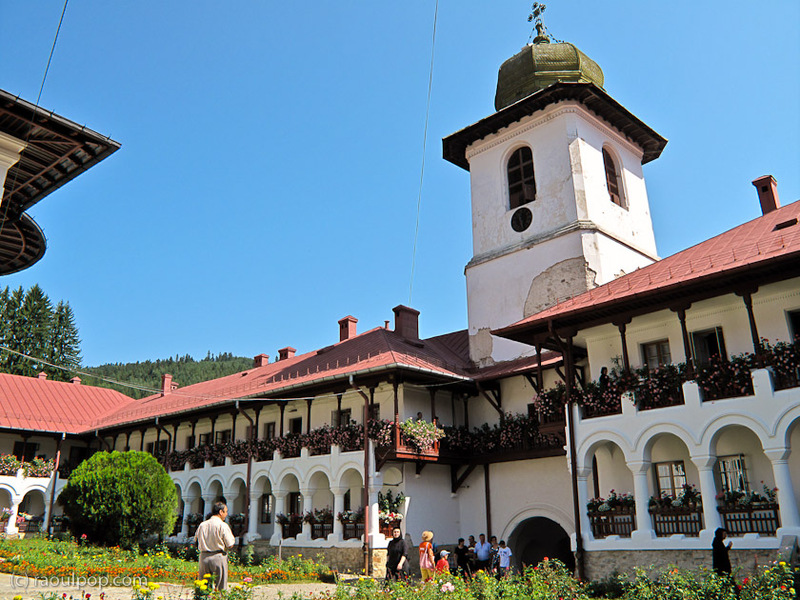 Mountain resorts like Borsa, Durau, Vatra Dornei and Borsec were all full. 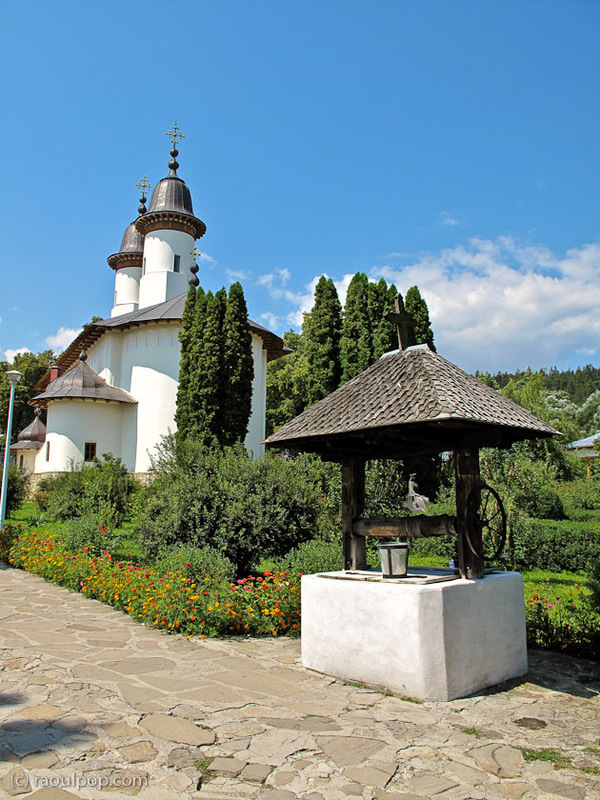 Since no lodging was to be found in the area, we drove to Radauti, one of the main towns in the province of Bucovina, hoping to find something there. We were looking for a 4-star place, either a hotel or a pension, and we were about to leave town, disappointed, when we decided to ask a gas station attendant who pointed us to David House, a 4-star pension nearby. Let me just tell you that while 3 stars may cut it in the US, it’s not enough in Europe, not by US or my standards, anyway. Read through our experience with hotels in Italy for more details on this topic, and trust me when I say that you want to look for 4-star hotels or pensions in Romania, if you can afford it. 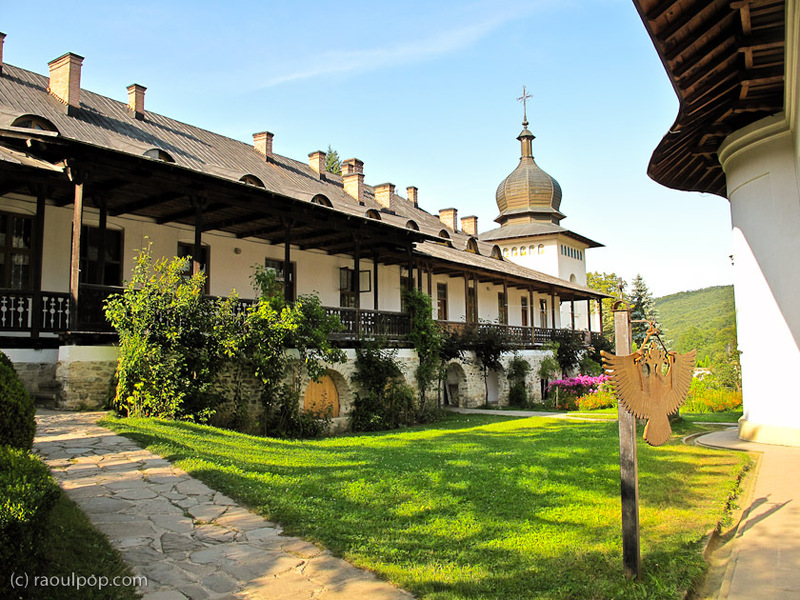 I’ll write more about David House in a future post, but let me just tell you our lodging experience there was superior to all of the other places we stayed at in Romania, and the price was great for the quality of the accommodations. While in Radauti, we walked on one of its streets. This is one of the scenes we saw. 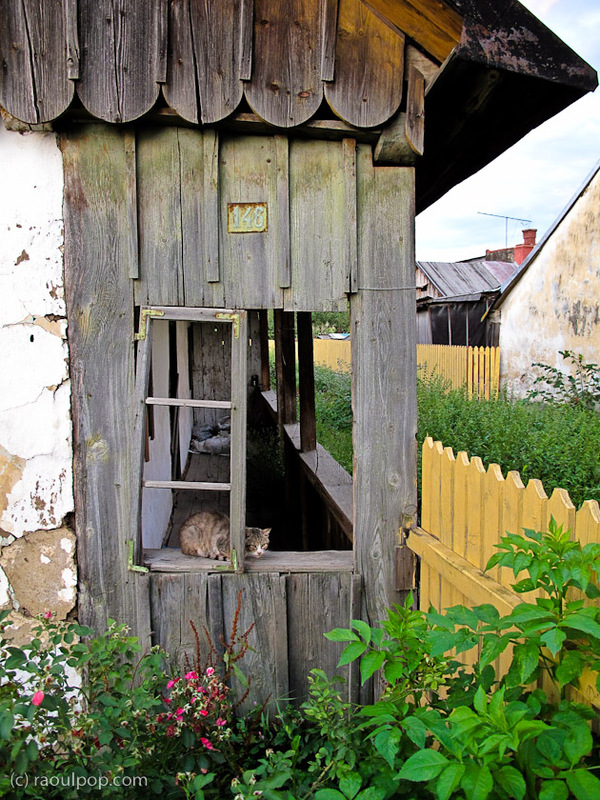 I love the character of this run-down traditional house and the cat perched on what used to be a windowsill. 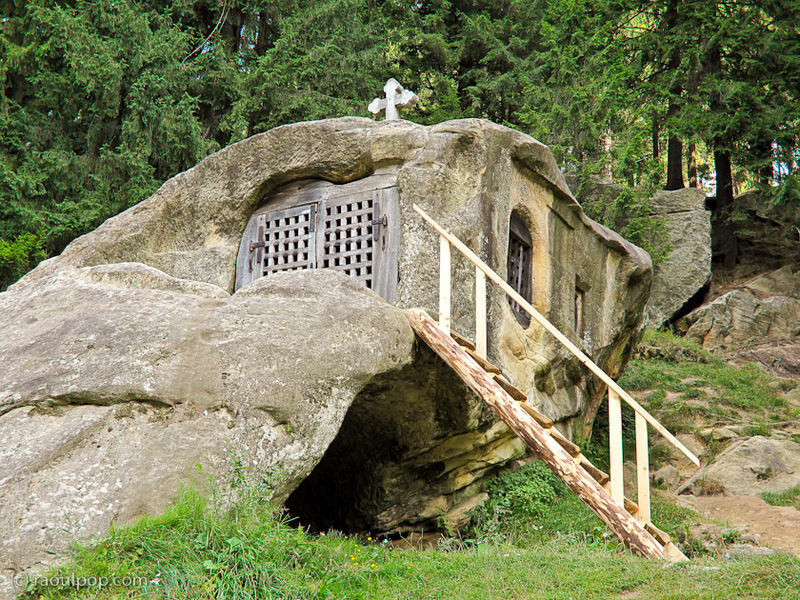 The next day, we visited the cave of a famous hermit called Daniil Sihastrul, who figures prominently in the history of the provinces of Moldova and Bucovina. He was the spiritual advisor of Stefan cel Mare, one of Romania’s great rulers. 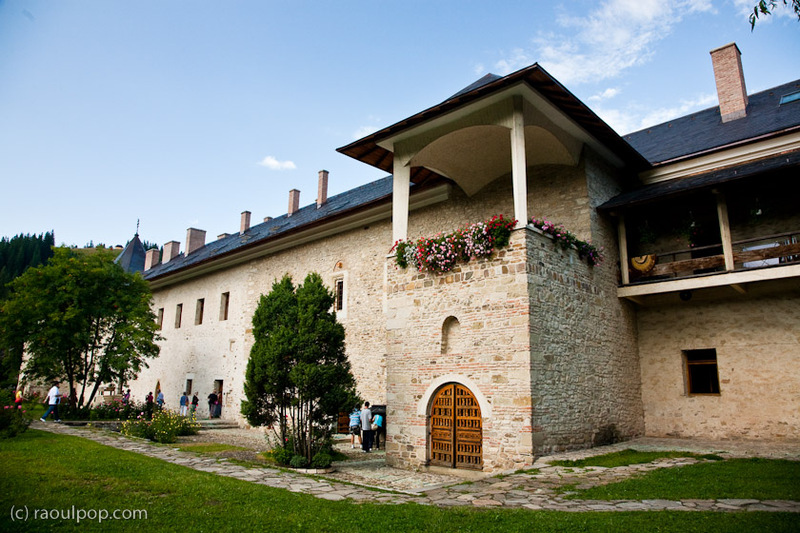 After that, we visited Manastirea Putna — an old and large monastery, built in the 15th century. 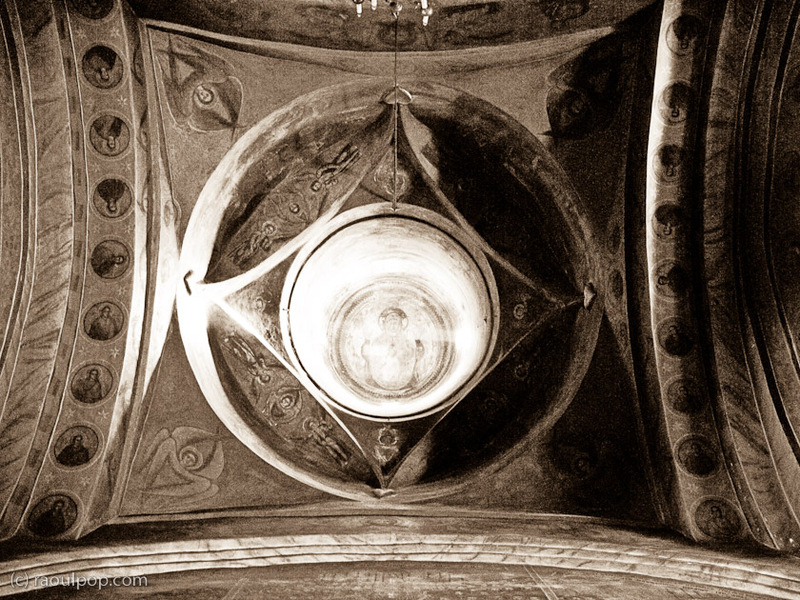 It contains the grave of Stefan cel Mare inside its church. 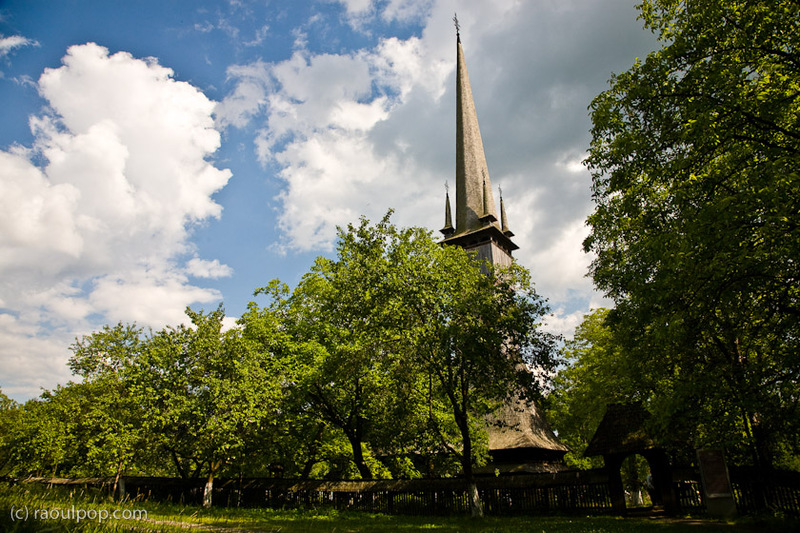 Very near Manastirea Putna, you’ll find the oldest wooden church in Romania, called Biserica de Lemn “Dragos Voda”. 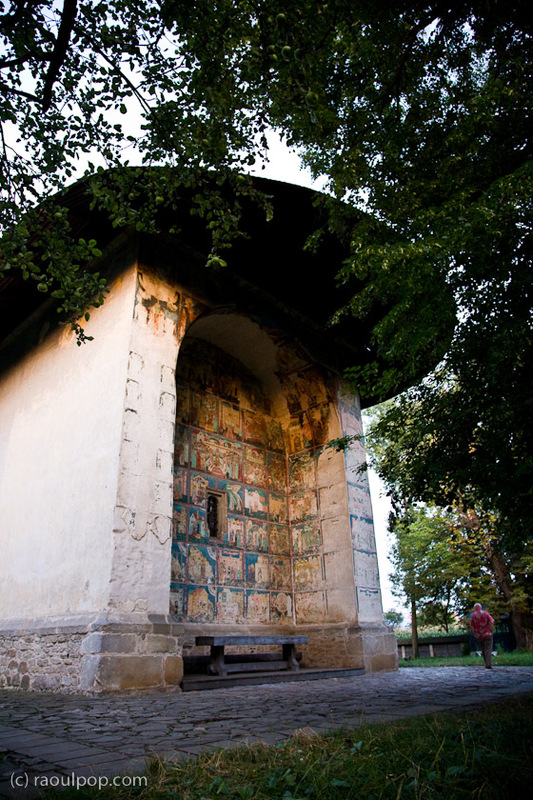 It dates from the 14th century. Manastirea Voronet was next. Historically speaking, it’s considered the most important example of medieval religious painting from the Moldova province. The exterior frescoes also distinguish themselves through a particular blue pigment that has withstood the passage of time particularly well. 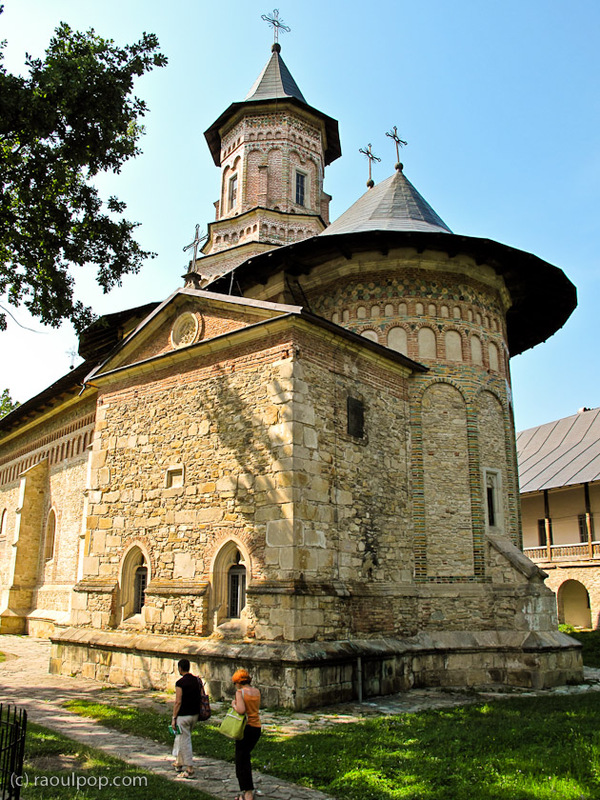 The last monastery we saw that day was Manastirea Humorului, which Ligia and I both liked very much. Perhaps it had to do with the way the sun’s rays fell on the buildings and gave them a golden hue, perhaps it had to do with the air, which was cleaner than in other places. All I can say is that we liked it. 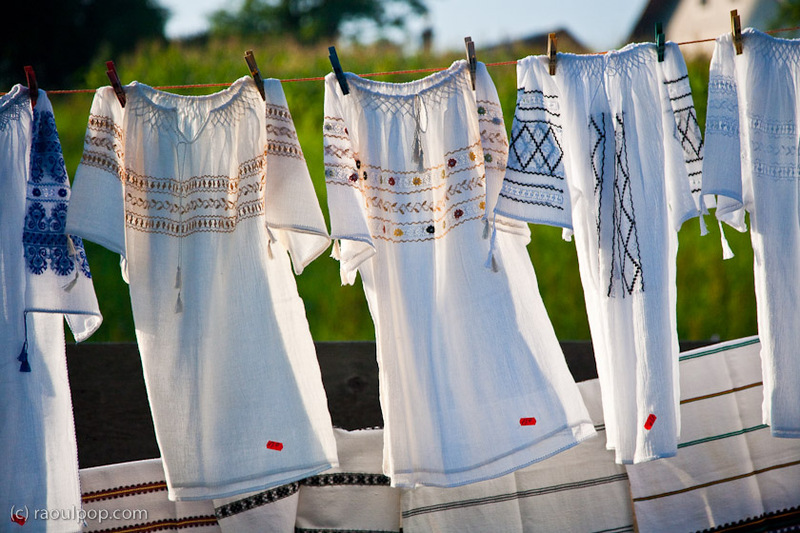 In the market near the monastery, artisans sold traditional handmade linen shirts, called ii. 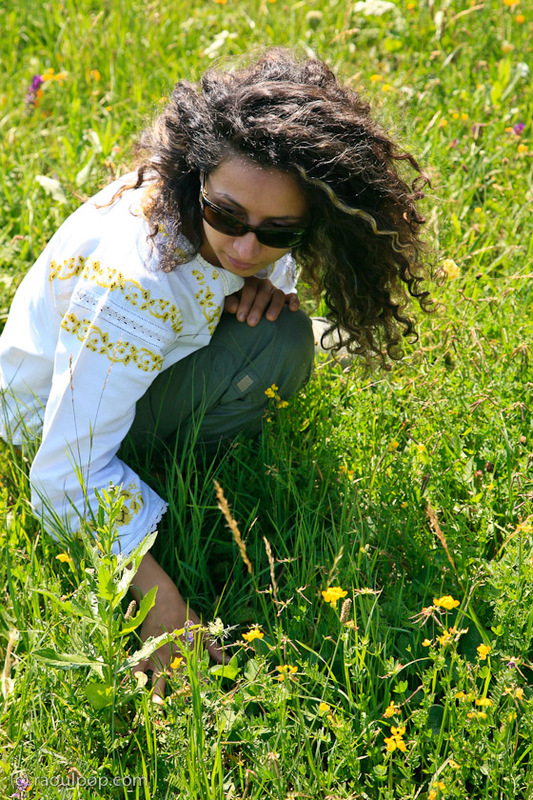 Each shirt takes anywhere from 1 week to 1 month or more to make, by hand. Ligia, my parents and I all bought several ii for each of us. They’re incredibly beautiful, and perfect for summer wear. Linen is wonderful to wear when it’s warm, because it airs much better than any other material, allowing the body to stay cool. We didn’t want to chance sleeping at another place that night, so we headed back to the David House pension in Radauti. 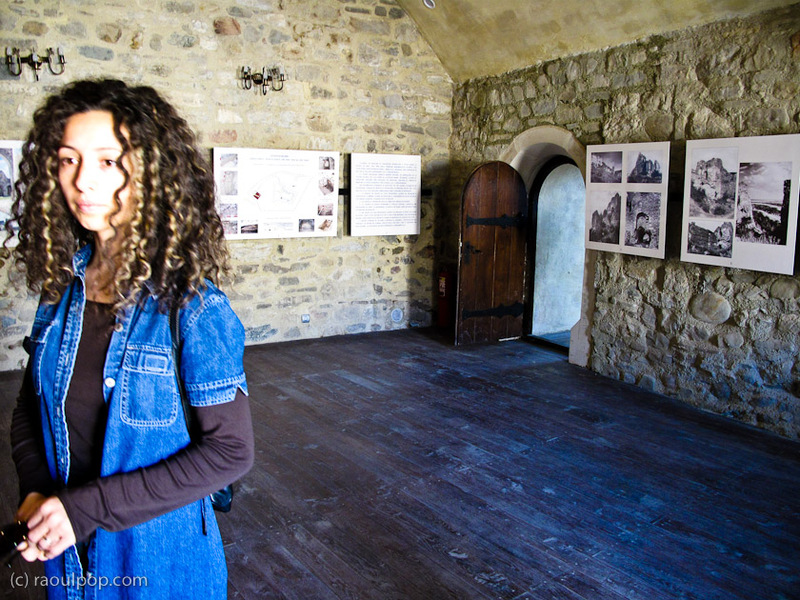 The next day, we visited Manastirea Arbore, which is not currently used as a monastery, but as a church. It is also undergoing renovations to the interior, but its interior frescoes are incredibly beautiful, and unlike many I’ve seen, have a more real feel to them. 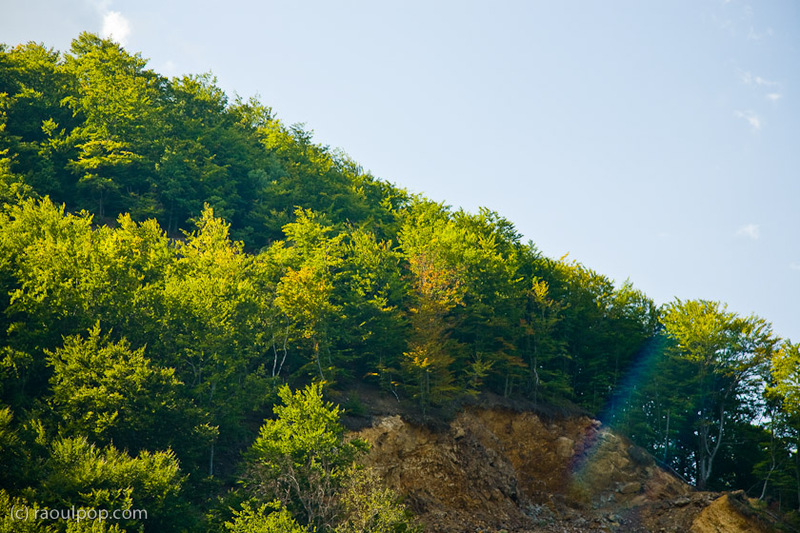 Near the village of Arbore, where the monastery resides, there’s a forest of tall conifers which begins as a sort of park on the main road but extends up the hillside and continues into a full-fledged forest beyond. 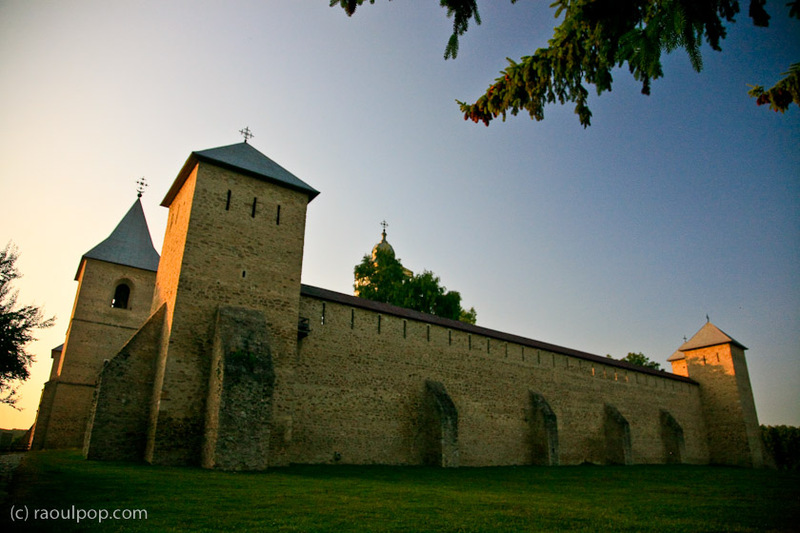 From there, we headed toward Suceava and the famous fortress where many rulers defended their country against foreign invasions. On the way, we stopped on a particularly scenic hilltop where a farmer’s family was harvesting hay. You can see them in the lower right corner of the photograph below. 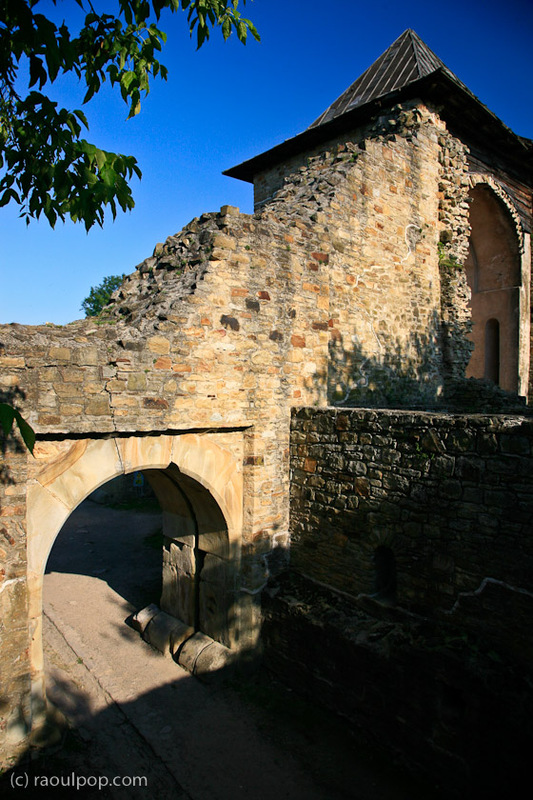 The official name of the fortress in Suceava is Cetatea de Scaun, translated roughly as the Castle of the Ruler. 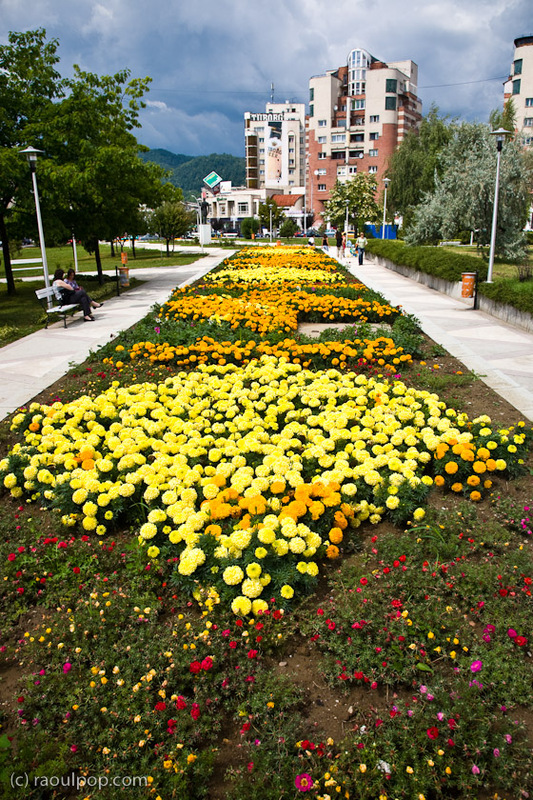 It is named so because Moldavian voevods considered it their capital, so to speak. 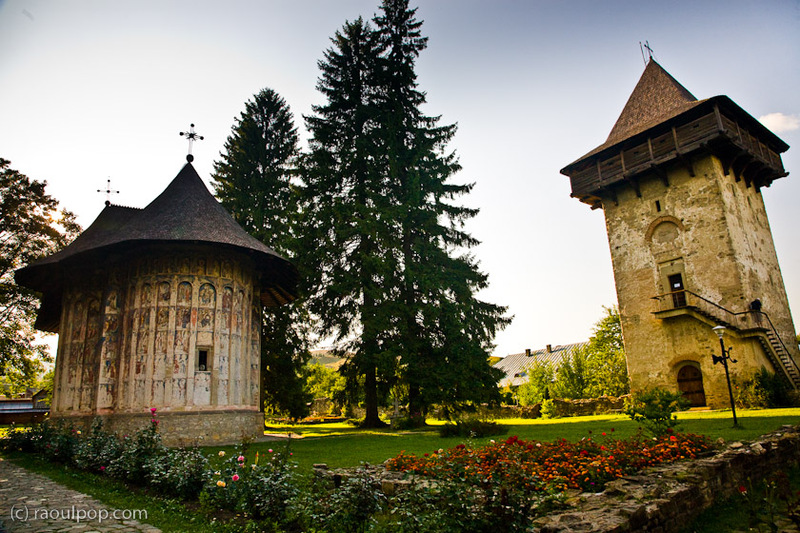 They had other castles where they lived and ruled, but returned to Suceava for the important periods of their rule. 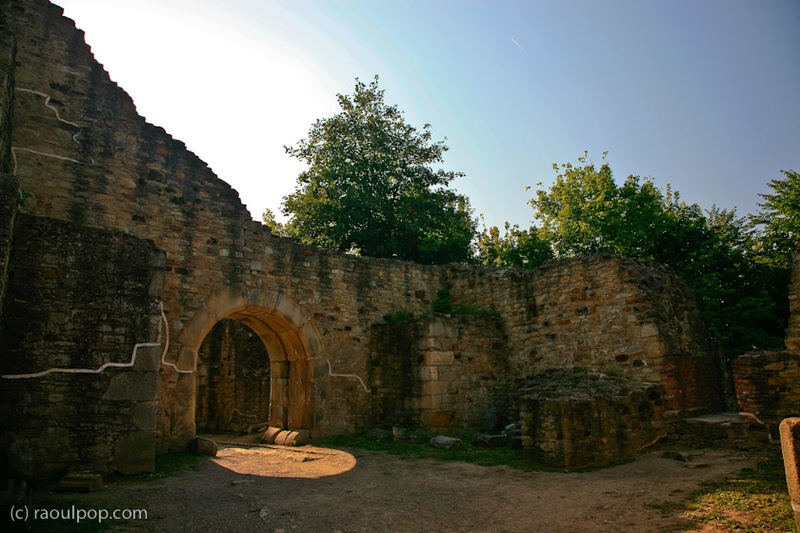 The last stop that day was at Manastirea Dragomirna and a nearby hermitage. 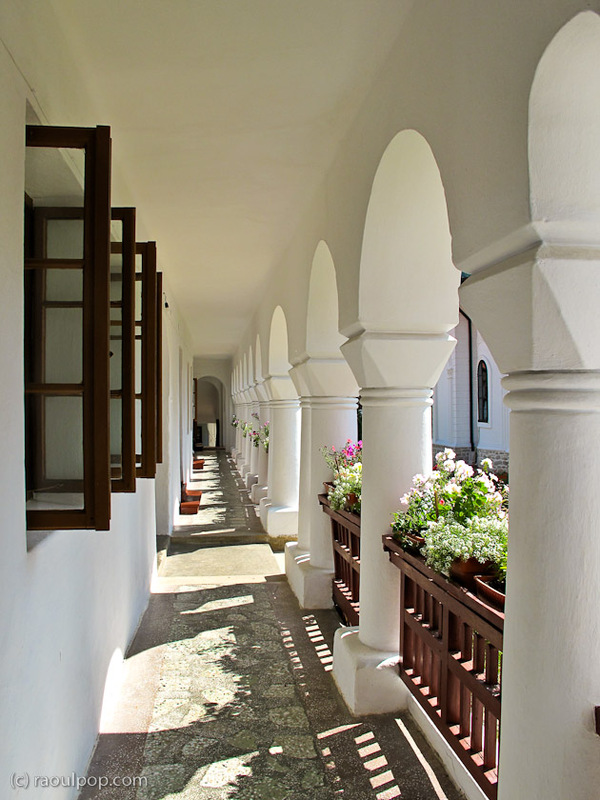 Dragomirna’s architecture is wonderful, and the monastery’s renovation efforts really show. The place looks great, and is being actively used by nuns. That night, we were unfortunately unable to find suitable lodging. Every place we found was 3 stars or below, and out of sheer desperation, around 11 pm, stopped at a pension on the outskirts of Tg. Neamt. It was a decision we regretted as soon as we began to unpack our bags, but the deed was done. 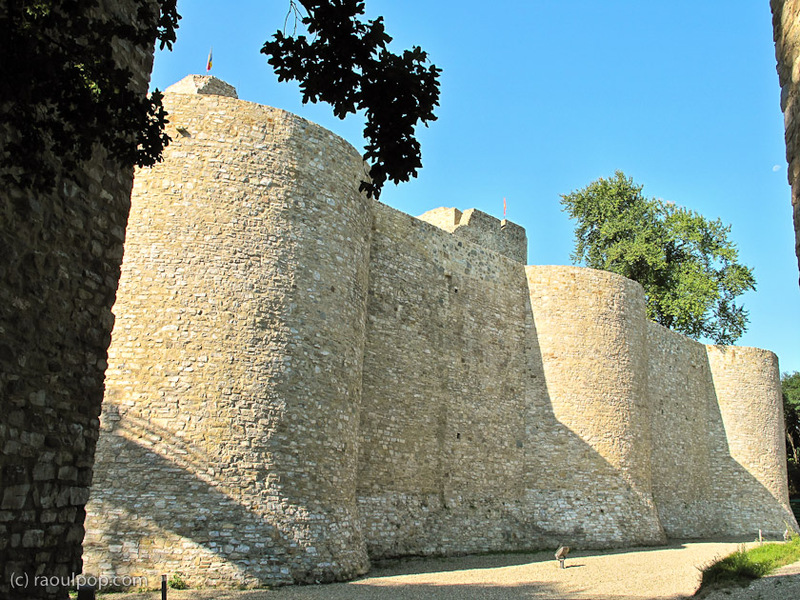 The next morning, we went on our way with bleary eyes to visit Cetatea Neamt, a famous historical fortress located in that city. Here, recent renovation efforts (completed in January 2009) had also paid off handsomely. 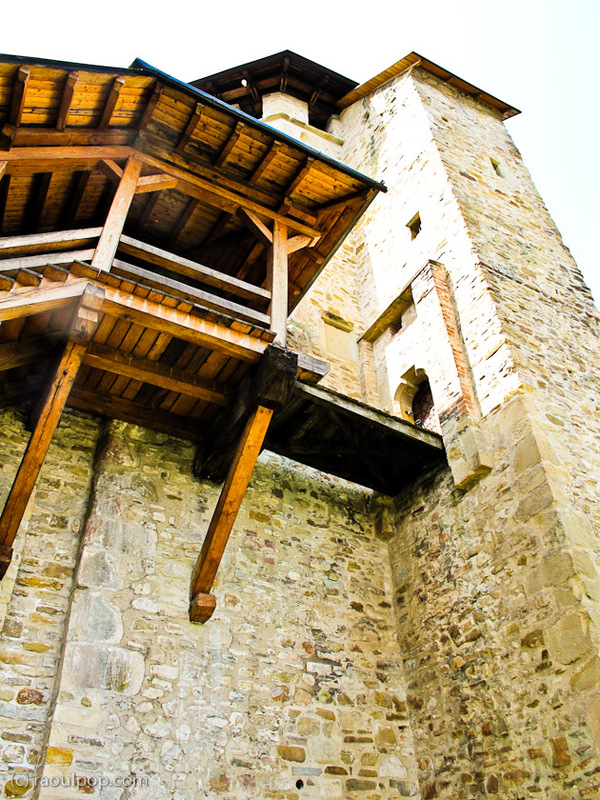 The place looked great, and it was a real treat to be able to visit many of the castle’s rooms — something that was impossible at Cetatea Suceava, which was in tatters, with all its upper floors destroyed by the passage of time. Manastirea Agapia was next. It’s run by nuns, and it’s got an interesting setup. 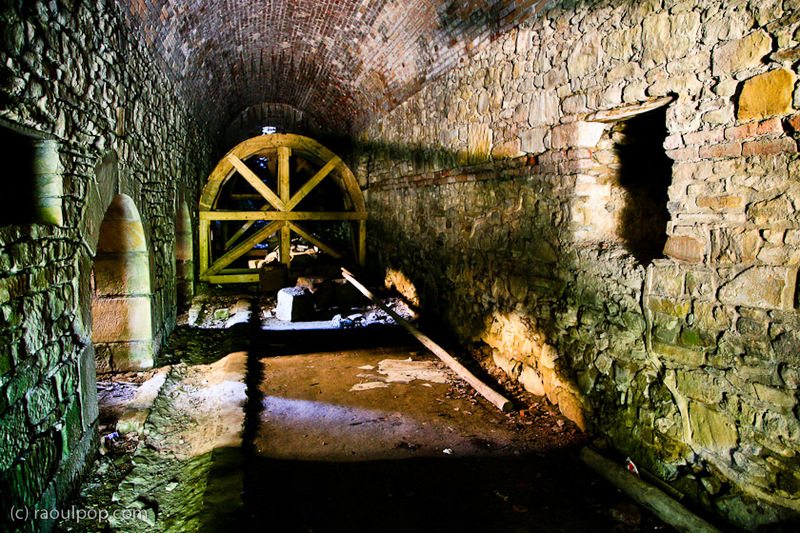 The cells of the nuns are spread through the village surrounding the monastery instead of being concentrated within. 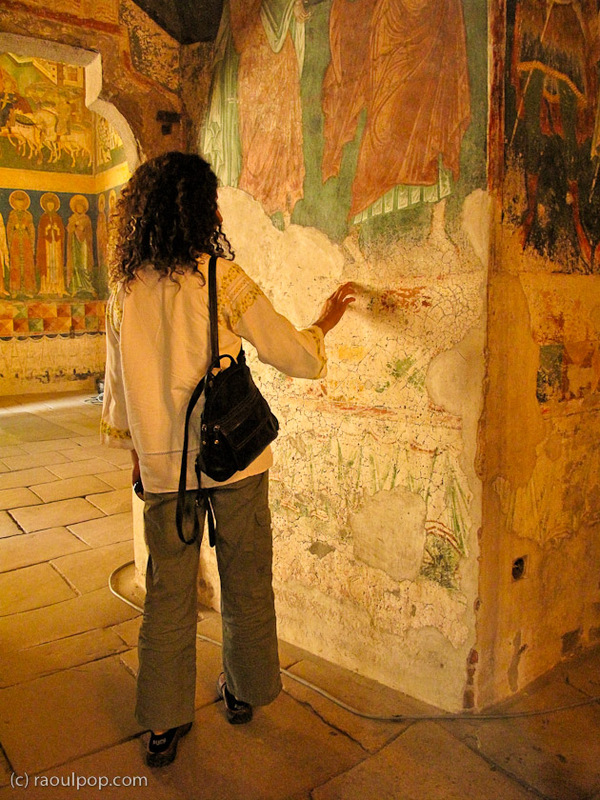 The monastery itself is famous for its interior frescoes, done by the famous Romanian painter Nicolae Grigorescu. 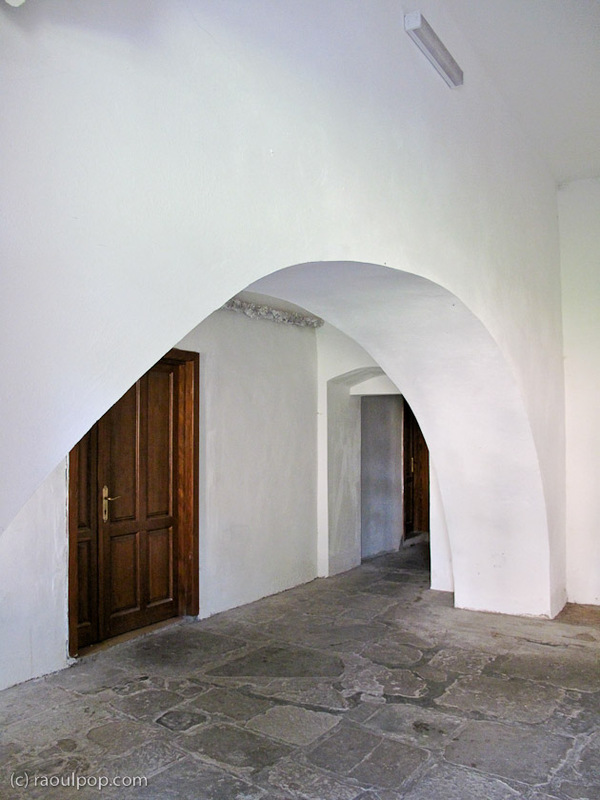 The monastery is also infamous in more recent times for the renovation work done to the cells of the nuns by Diekat, a Greek construction company. 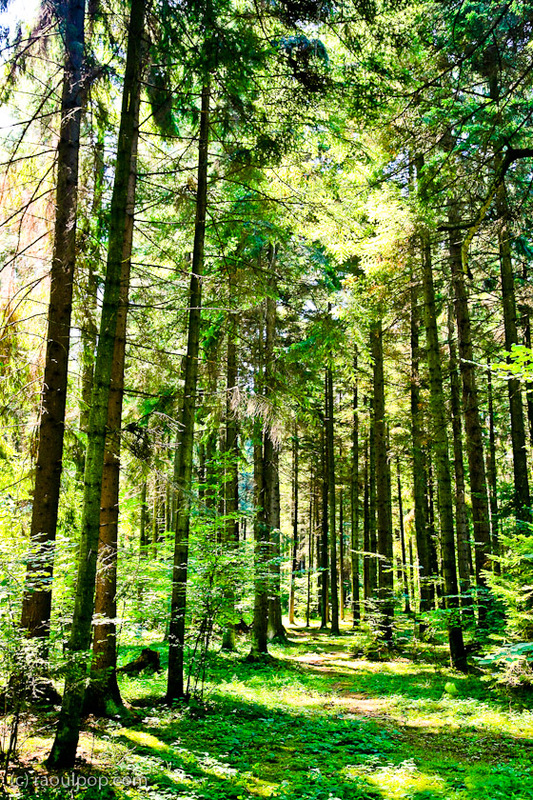 They used green, untreated wood, which through their shoddy workmanship, was exposed to the elements over the winter and developed a fungus that caused several nuns to fall seriously ill. They charged 2 million Euro for the work, never finished the job, and were never held accountable by anyone for their crimes. [source] May God punish them to the fullest for what they’ve done. 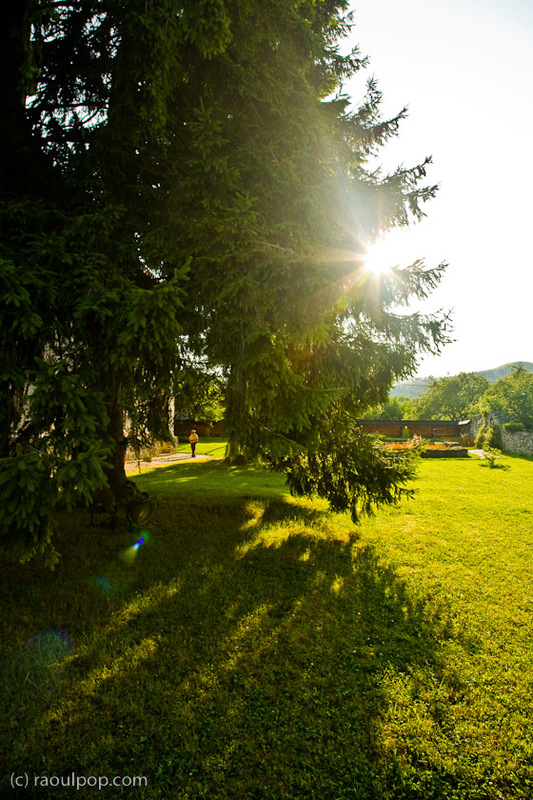 Manastirea Varatec, nearby, is also a nice place to visit. It’s of more recent origins than Agapia and others we visited. 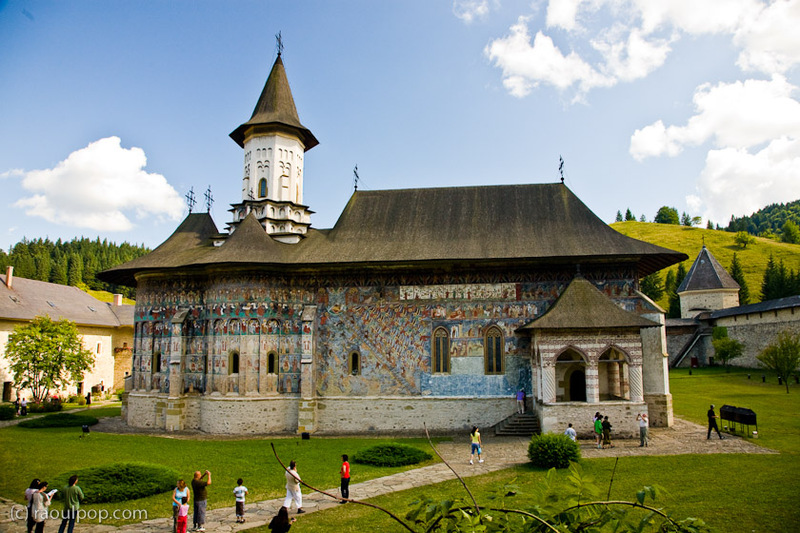 After lunch in town, we moved on to Manastirea Neamt, which is the ruling body for all monasteries in the provinces of Bucovina and Moldova. The monastery has a somewhat unusual feature: an ossuary where certain of the bones of the more notable monks are kept. 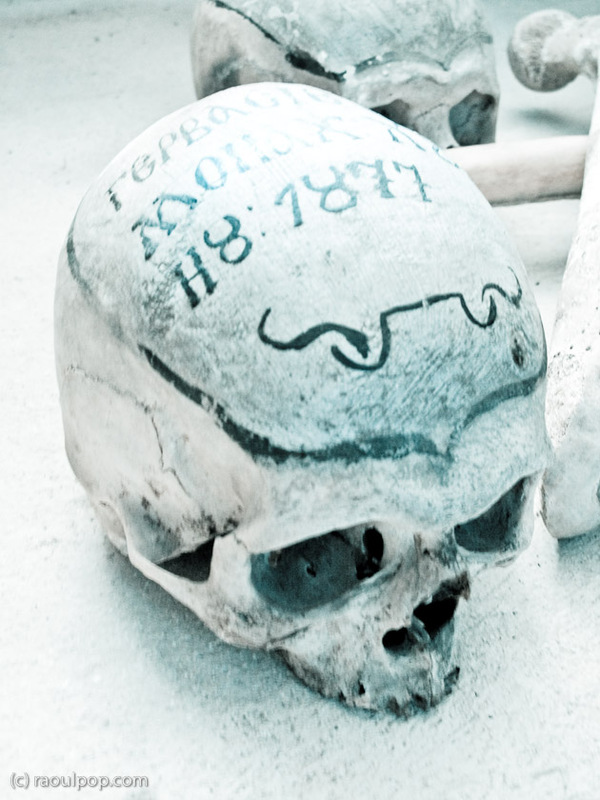 Their skulls are inscribed with their names, a detail or two about their lives, and their year of death. This is one of them. 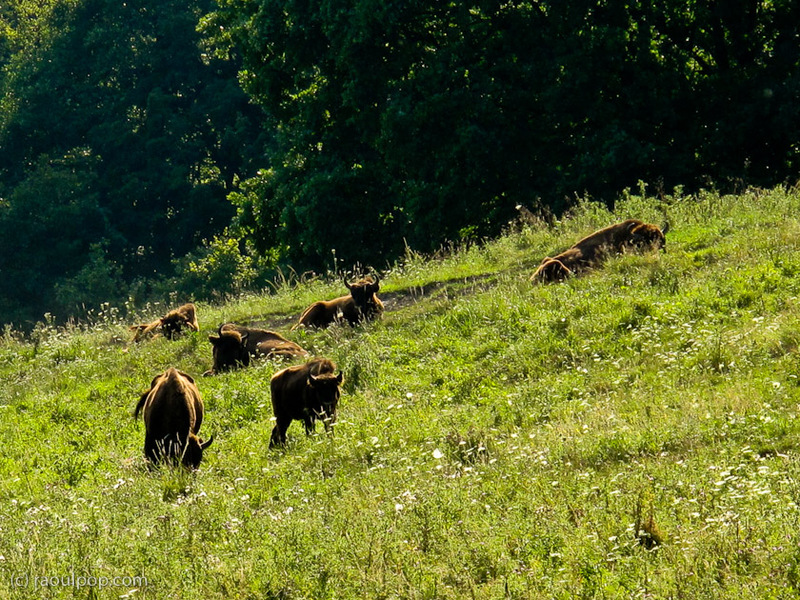 While on the road to Manastirea Secu and Sihastria, we found a nature preserve for aurochs, also known as European bison. These are the ancestors of our domesticated cattle, or so the story goes. I wanted to get some up-close photos, but the aurochs (known as zimbri in Romanian) weren’t cooperative. They insisted on resting on a muddy cliff well removed from me and my camera, as it was a hot afternoon. Rezervatia de Zimbri si Fauna Carpatina "Dragos Voda"
We were incredibly exhausted after this short and intense trip, and rushed to find lodging for the night. Again, everything was booked, so we kept driving on, hoping against hope to find some 4-star pension or hotel before nightfall. Finally, we did. 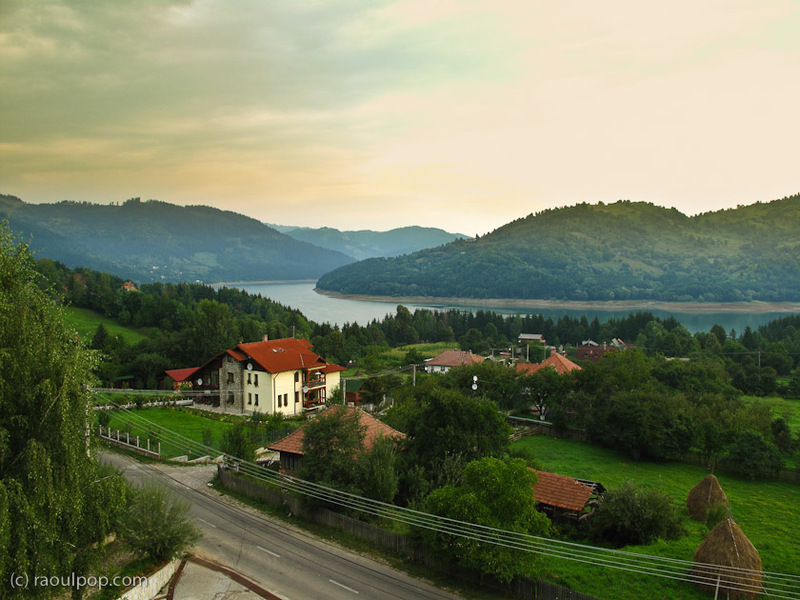 It was a place called Vila Ecotour, in the village of Ceahlau, near Durau, on the shores of Lacul Bicaz. The pension was perched on the slope of a tall hill and had amazing views of the village, the lake and the adjoining mountains. What a wonderful location! The last day was spent making our way back to Baia-Mare, still tired, sick of driving, but richer for having seen and experienced such natural and man-made beauty. I plan to post more photos from each place we visited in separate articles, so stay tuned for that. 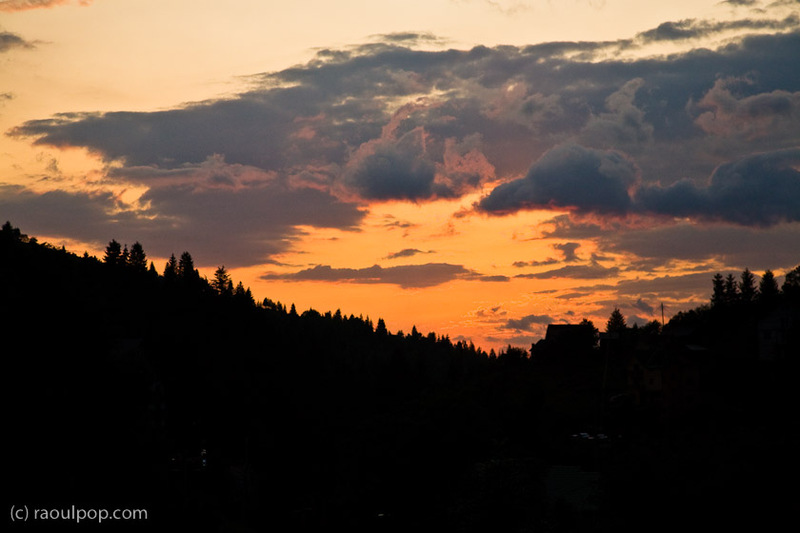 it was a pleasure to take a look to your pictures from Bucovina. 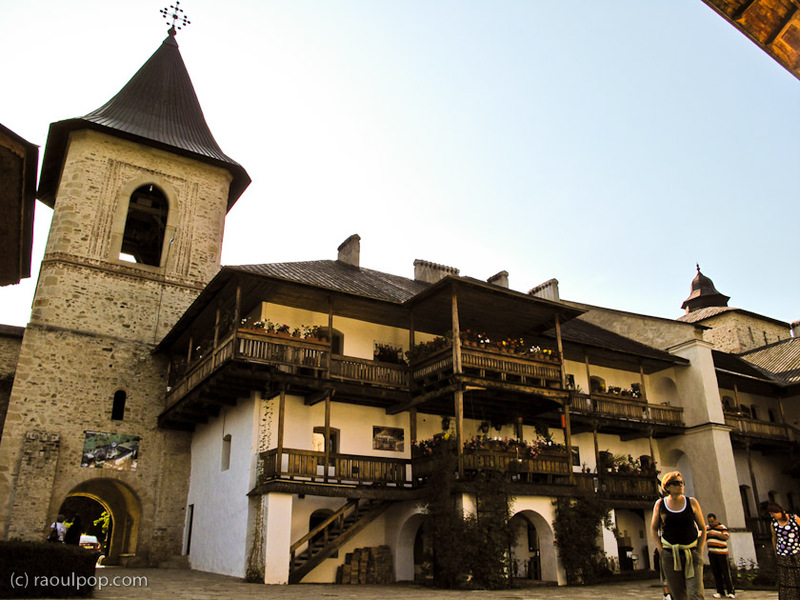 I found your blog accidentaly, looking for some comments about Bucovina. 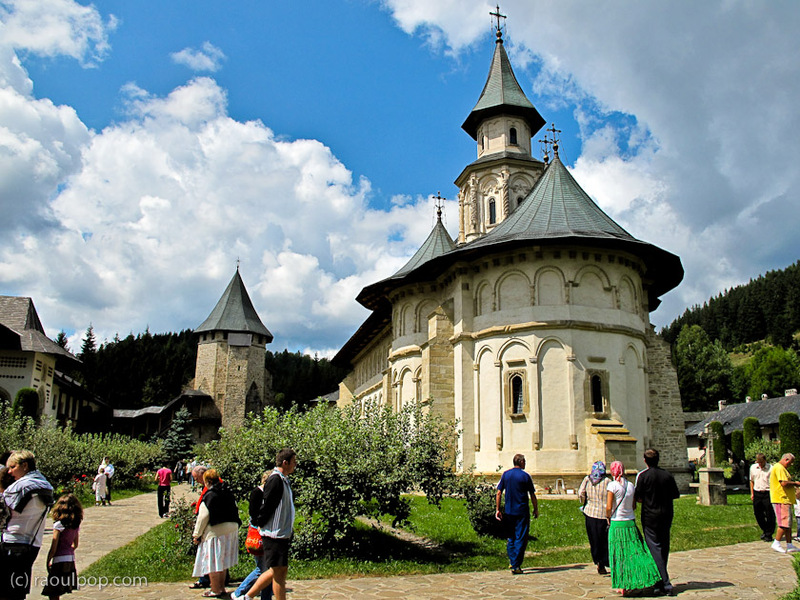 We are trying to improve the things in tourism here in the area… Question: can we allow us (a tourism association http://www.bucovinaturism.ro) to use your pictures for promotion of Bucovina (on fairs, leaflets…) ? We will keep your name on the pictures, just like on the blog. Thank you and best regards from Bucovina. Hi Carmen. I’m glad you liked my post and my photos. Yes, you may use them, as they are on my blog. 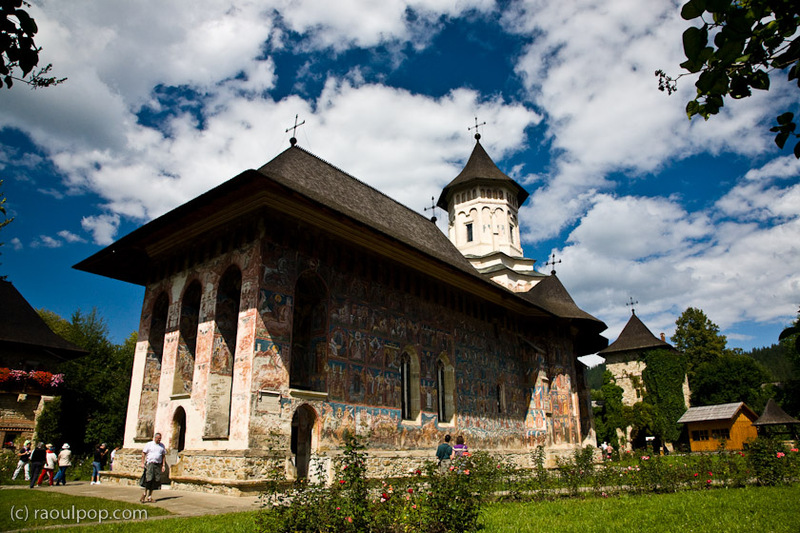 If you’d also like to license higher quality photos, you can find photos from Bucovina and from Moldova in my photo catalog. 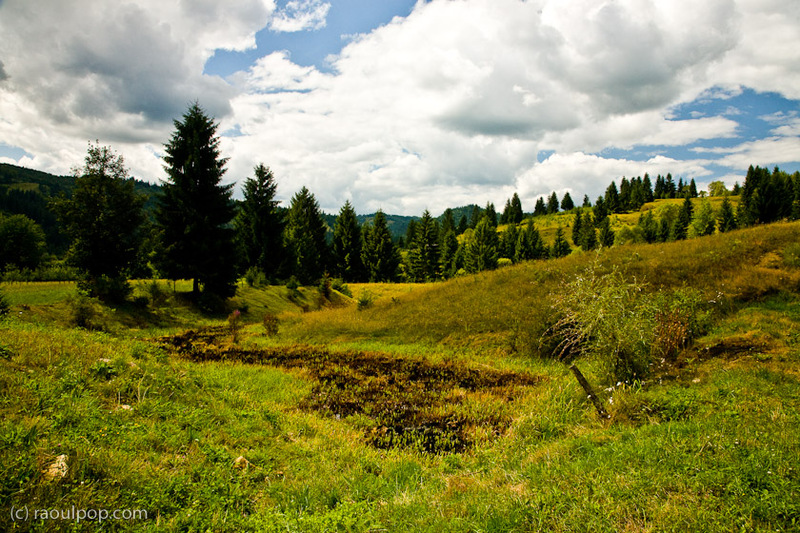 For example, here are my published photos from Bucovina: http://www.raoulpopphotography.com/Travel/Romania/Bucovina/9329528_DJNPe. My prices are geared toward Americans and Western Europeans, but I will gladly issue you a coupon that will reduce the prices to make the photos more affordable to you. Just let me know if you’re interested. 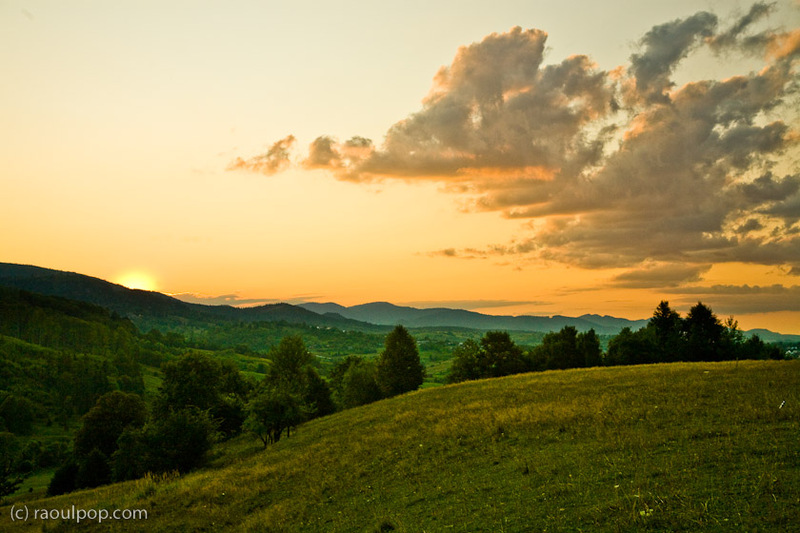 I wish you all the best in your endeavors to spread the word about Bucovina. It is a beautiful place, and more people ought to know about it. 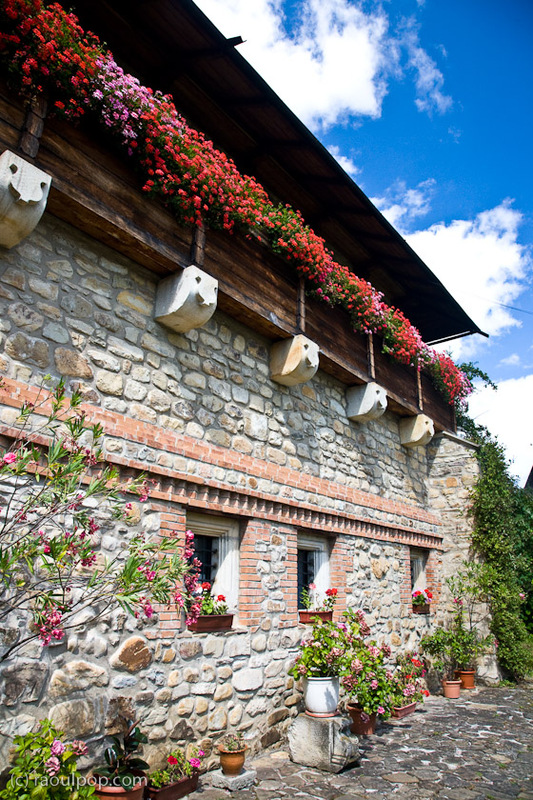 By the way, I also highly recommend “David House”, a beautiful 4-star pension in Radauti. We stayed there for two nights and we loved it — it was clean, comfortable, the owner was very friendly, and the food was great. 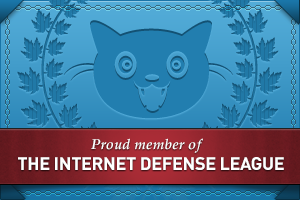 It’s not listed on your website, but it should be, people should know about it. Very beautiful pictures. Romania itself is a beautiful country with welcoming people. With time and will, we can have a very nice trip. Peter, I had a look at the terms for submitting a photo to your site, and there’s no way on earth I will grant you an exclusive, royalty-free, irrevocable and perpetual license to any image of mine. I’d have to be crazy to do that, especially when you want my images for free. Cheers, and I’m glad you like Romania. Wow – you have shown Romanian in its best light. 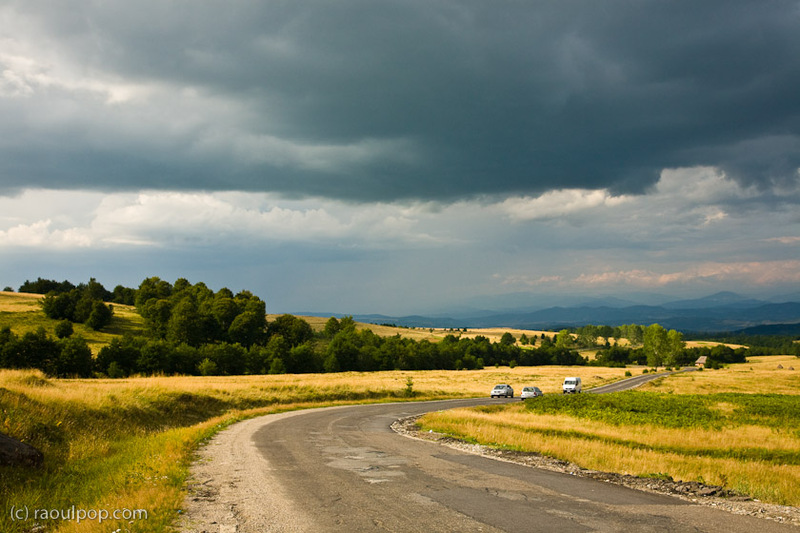 At the moment, I am trying to build up a photo library of great pictures of Romania, and I would be thrilled if you would consider adding one of stunning your pictures onto my site ( http://www.pictures-of-romania.com ), along with a comment about why you liked Romania or that particular place so much. FYI Moldova does not consider itself a province of Romania. D.S., you’re confusing the province of Moldova, which is in Romania, with the Republic of Moldova, which is a separate country. The Republic of Moldova was at one point part and parcel of Romania itself, until the Russians took it from us. For the record, I was referring to the province of Moldova in my article. It might help if you read through this. Thanks Julie! 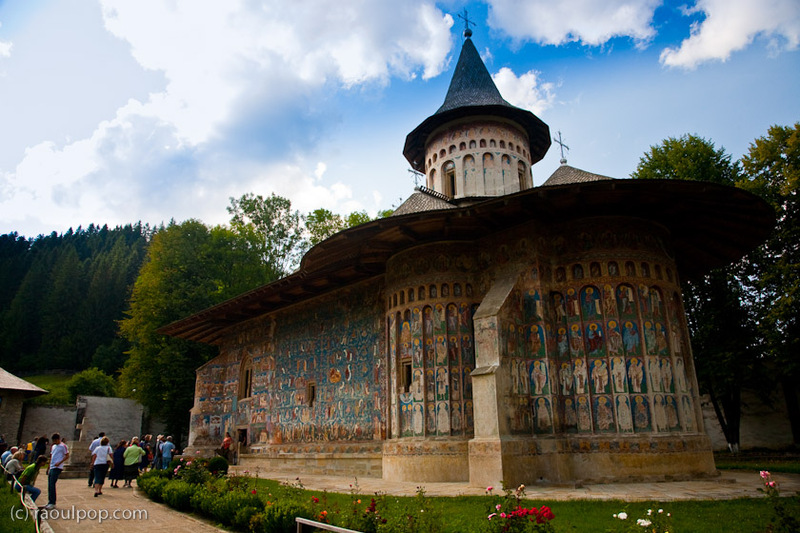 Romania is incredibly beautiful, so come if you can. The problem here though is with tourist accommodations. 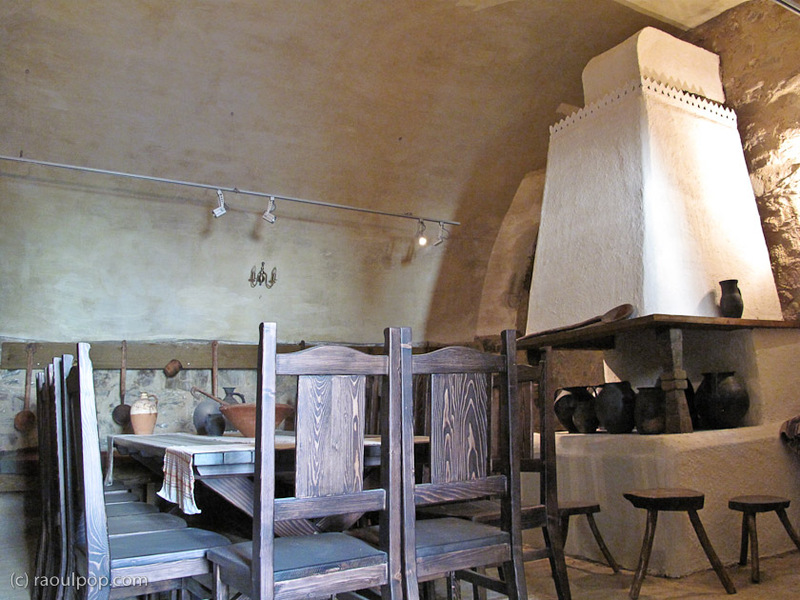 While tourism is encouraged, the accommodations leave a lot to be desired (infrastructure, lodging, prices — especially prices), when I compare them with those in other European countries. The tourism industry could be huge here, because there’s so much to see, if only Romania could get its act together and cater to tourists a little better: build better roads, provide better customer service, more affordable prices, cleaner and nicer lodging, cleaner roads, streets and towns — generally make things look nicer and cleaner all around. Lovely photos, Raoul. We were looking at the possibility of a European vacation just last night. Makes me want to go!